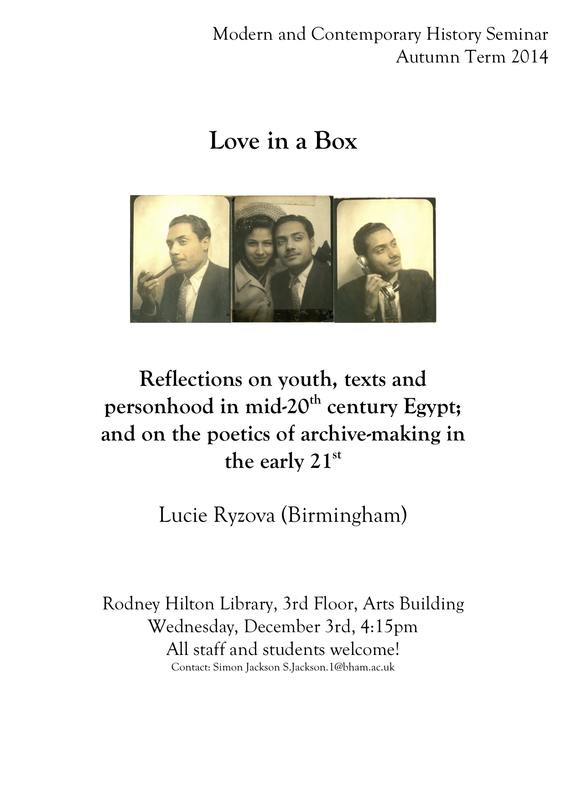 See you at 16:15 in the Rodney Hilton Library, on Wednesday 26 November. 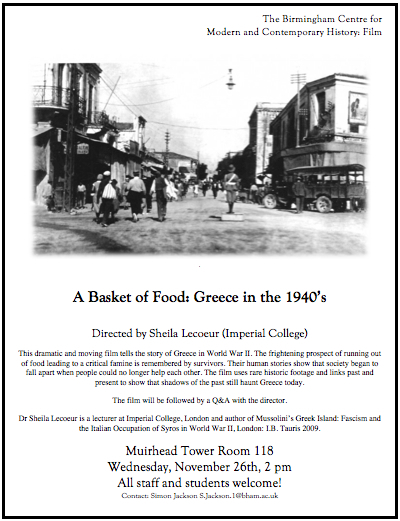 Film Showing: The Politics of Famine in the Greek 1940s. Muirhead Tower Room 118, Wednesday 26th November, 2 pm. All welcome. The screening will be followed by a Q&A with the director. This dramatic and moving film tells the story of Greece in World War II. The frightening prospect of running out of food leading to a critical famine is remembered by survivors. Their human stories show that society began to fall apart when people could no longer help each other. The film uses rare historic footage and links past and present to show that shadows of the past still haunt Greece today. Dr Sheila Lecoeur is a lecturer at Imperial College, London and author of Mussolini’s Greek Island: Fascism and the Italian Occupation of Syros in World War II, London: I.B. Tauris 2009. 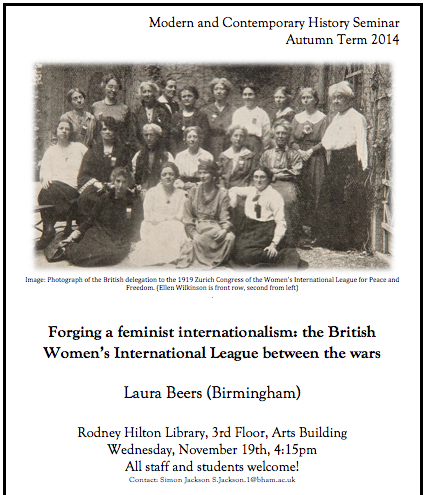 Week 8 Seminar: Laura Beers – ‘Forging a feminist internationalism: the British Women’s International League between the wars’. See you at 16:15 in the Rodney Hilton Library, on Wednesday 19 November. 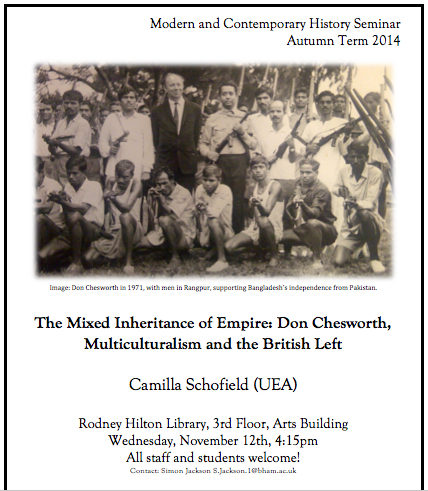 Week 7 Seminar: Camilla Schofield – ‘The Mixed Inheritance of Empire: Don Chesworth, Multiculturalism and the British Left’. ‘The Mixed Inheritance of Empire: Don Chesworth, Multiculturalism and the British Left‘. 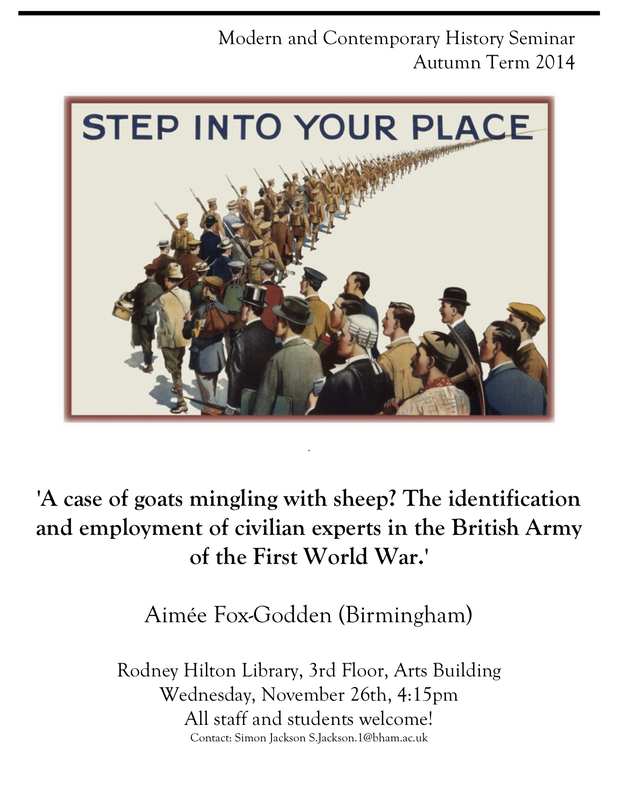 See you at 16:15 in the Rodney Hilton Library, on Wednesday 12 November.